2. Delicate Balance Listening to a piece of music for the first time is unenjoyable; as the Greek proverb put it, “unheard melodies are never sweet.” Yet it’s also unenjoyable to listen to the same piece too many times. In listening to music, there’s a delicate balance between novelty and satiety. 3. Combined Arts Nietzsche says that the early Greeks had a Dionysian art that combined poetry, music, and dance. But over the course of time, poetry, music, and dance were separated, and became specialized. What we call “classical music” usually doesn’t include poetry or dance. 8. Praise the Dead, Stone the Living The creative individual opposes current intellectual fashions. He’s usually neither understood nor appreciated by his contemporaries. He’s ignored and greeted with silence, or condemned by a chorus of critical voices, or persecuted, sometimes to the point of execution. Yet the very people who ignore him or condemn him or persecute him, strive to outdo each other in paying homage to the creative individuals of the past. “We would not have voted to poison Socrates,” they say; “we would not have looked on approvingly as Bruno burned; we would not have thrown stones into Rousseau’s house; we would not have mocked Kierkegaard for his skinny legs and his odd clothing; we would not have harassed and insulted van Gogh.” But if you confront these same people with a contemporary version of Socrates, of Bruno, of Rousseau, of Kierkegaard, of van Gogh, if you confront them with a creative individual, they will ignore him or condemn him or persecute him. 9. The Stranger’s Reception In rural areas, people are glad to see other people, they appreciate other people, they’re disposed to like other people. In small cities, people take other people for granted; they’re disposed neither to like other people nor to dislike them. In big cities, people wish that there were fewer people; they’re disposed to dislike other people and to fear them. Doing Well Making a lot of money (see Successful). Freud Obsolete. All his theories have been disproven. Law The extension of politics by other means. To Make A The essence of life; one who makes a good living is one who makes a lot of money. Neurotic Someone you don’t get along with. Nietzsche Not a real philosopher. Philosophy Is there any market for it? Right Something one desires, and thinks that one deserves. There’s a right to have a job, a right to have housing, a right to have a TV, a right to be informed of your rights, a right to march in order to demand your rights, a right to invent new rights, etc., etc. Samovar In Russian novels, every house has at least one. One doesn’t know what it is. Sennet Shakespearian stage direction. One doesn’t know what it is. Does it have something to do with a hautboy? Successful Making a lot of money. Television Say that you don’t watch it much. 11. Happiest Days They say that the two happiest days in the life of a boat owner are the day he buys his boat, and the day he sells it. Perhaps one could say the same thing about readers: the happiest days in a reader’s life are the day he starts a new book, and the day he finishes it. Let’s assume that our unconscious can read the book of fate. Does that allow us to change fate? For example, if Lincoln believed his prophetic dreams, in which his assassination was a fait accompli, could he avoid assassination? If he dreamed that he had been assassinated, and if he told people about his dream, and if perhaps other people dreamed the same thing, is it possible that someone around him would say, “let’s increase the guard that protects him, let’s try to dissuade him from entering public places, let’s try to change fate.” Has this ever happened? Has our anticipation of the future ever enabled us to change that future? Throughout history, man has tried to foretell the future, avoid misfortune, and seize good fortune. Even in recent times, this ancient habit can still be found. When Reagan was President, his wife often consulted prophets and fortunetellers, asking them what days were safe for her husband to travel, appear in public, etc. Will mankind forever be divided into two groups, those who fall victim to gross superstition and those who fall victim to shallow rationalism? Or can we enjoy the benefits of rational, scientific thinking, and at the same time appreciate and utilize the mysterious powers of the unconscious? Did Lincoln manage to combine respect for reason with respect for the occult? 13. Clausewitz and Chance In his famous treatise on war, Clausewitz said, “There is no human activity that stands in such constant and universal contact with chance as does war.... Of all branches of human activity, [war is] the most like a game of cards.” It’s characteristic of a rational thinker to emphasize chance, just as it’s characteristic of a non-rational thinker to emphasize fate. Clausewitz was a product of the Enlightenment, and he has a rational-scientific worldview; he likes to use mathematical terms like “laws of probability,” and scientific terms like “centers of attraction” and “the principle of polarity.” Doubtless Clausewitz would be uncomfortable with the idea that a mysterious fate shaped the outcome of wars. But Clausewitz’s contemporary, Napoleon, felt that fate was leading him to victory early in his career, and he felt that fate had turned against him at Waterloo; Napoleon was more impressed by fate than by chance. Perhaps what we call “chance” doesn’t really exist, but is shaped by fate, just as Freud argued that we can’t think of a random number, because our choice of a number will be shaped by unconscious factors. The ancient practice of divination uses chance events to learn fate, and predict the future. The ancient Chinese text known as The Book of Changes (or I Ching) uses dice and other random events to get advice and predict the future; Jung said this book never erred. Clausewitz said war was like a game of cards, but modern playing cards originated from Tarot cards, and Tarot cards were used (and still are used) for divination. Perhaps neither war nor cards are matters of pure chance, as Clausewitz thought. 15. The Art of Memory When Greco-Roman orators wanted to memorize a long speech, they sometimes constructed an imaginary house, with images in each room. The images were linked, in their memory, to parts of their speech; as they delivered the speech, they would move through the house, and the images would help them remember their speech. The Hermetic philosophers of the Renaissance, such as Giordano Bruno, expanded this ancient mnemonic device into a way of committing the whole universe to memory. Bruno constructed “memory wheels,” which used images to remind him of stones, metals, plants, animals, planets, and also to remind him of 150 historic figures, who in turn reminded him of world history, the history of science, and the history of ideas. In Bruno’s memory system, everything in the world was linked to everything else. Thus, Bruno’s memory system symbolizes the basic Hermetic teaching that All is One, that the universe is an organic whole, that everything is connected to everything else. Not only are objects inter-connected, but also ideas, philosophies, religions. The Hermetists subscribed to a “perennial philosophy” that tried to synthesize philosophies and religions. In 1486, at the age of 23, Pico della Mirandola went to Rome with 900 theses drawn from various philosophies and religions, and offered to prove, in a public debate, that they were all compatible with each other. A later Hermetist, Athanasius Kircher, attempted an even grander synthesis; in 1652, Kircher attempted a “synthesis of all mystical traditions,”4 including Mexico and Japan. Are images more effective than words — more apt to enrich the personality, more easily stamped on the memory? Bruno and other Hermetists seemed to think so. Bruno thought that the best writing systems were image-based systems, ideogram systems — like Egyptian hieroglyphs, or Chinese characters. These ideogram systems (in Bruno’s view) are in direct contact with reality (since they consist of pictures of actual things). Compared to these ideogram systems, sound systems (phonetic alphabets) like Greek, Latin and other European languages, are (in Bruno’s view) a step backward.8 Here, as elsewhere, Bruno (and many of his contemporaries) had a high opinion of the ancient Egyptians. Turkish military power was a factor in popularizing the Hermetic texts in the West. Turkish pressure on the Byzantine empire prompted that empire to seek help from their fellow Christians in the West, and to resolve their religious differences with the West. At the Council of Florence in 1439, Byzantine scholars met Italian scholars, and they began lecturing on Plato, the Neoplatonic writers, and the Hermetic texts. In 1453, Constantinople finally fell to the Turks. Ficino began translating Plato into Latin. In 1463, Cosimo de Medici, Ficino’s patron, asked him to lay aside his translation of Plato, and focus instead on the more important Hermetic texts. The Hermetic texts remained influential for about 150 years. In 1614, a scholar named Isaac Casaubon demonstrated that the Hermetic texts weren’t as ancient as people thought — they were later than the Bible, later than Greek philosophy. Casaubon’s work undermined the authority of the Hermetic texts; philosophers like Descartes and scientists like Kepler further reduced the influence of Hermetism. But Hermetism didn’t die out completely, and the debate between rational philosophy and non-rational philosophy continues to this day. 16. 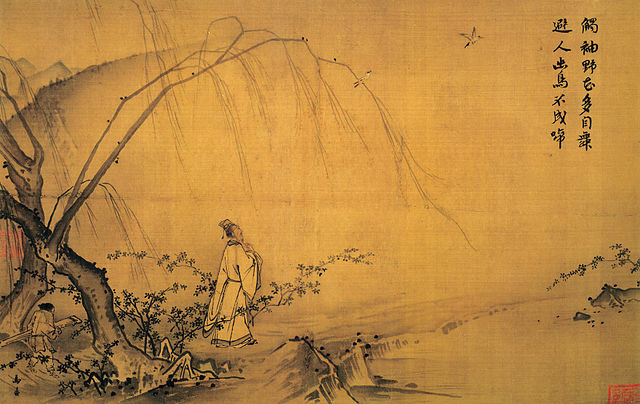 Chinese Painting In China, the most important type of painting was landscape painting. Like Western painting, Chinese painting began as figure painting. Not until around 900 A.D. did landscape become the dominant type of painting in China. In the West, landscape didn’t become prominent until around 1800. Why was landscape a more important type of painting in China than in the West? 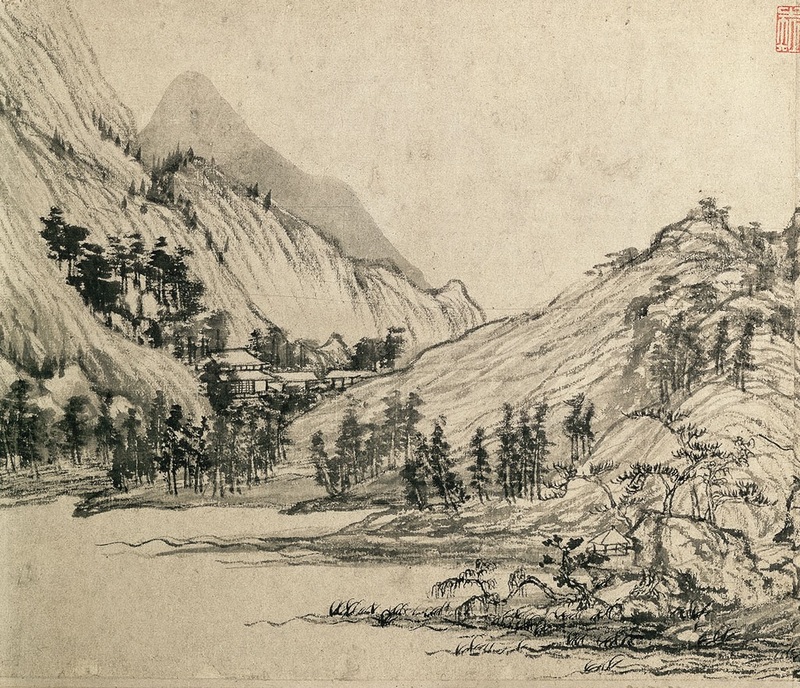 And why did landscape painting develop much earlier in China than in the West? In the West, cultural development was arrested during the long period known as the Dark Ages; during the Dark Ages, the accomplishments of the ancient Greeks and Romans were largely lost. In China, on the other hand, cultural development was more steady and continuous; China experienced nothing comparable to the Dark Ages. The Chinese felt closer to nature than the West did. The Chinese saw man as part of the world, while the West saw man as the “master and proprietor of nature” (as Descartes put it); the West felt that it was man’s task to “subdue the earth.” The Chinese felt that the human spirit was akin to the spirit of the rest of the universe, while the West felt that man was special and different, that God had made only man in his own image, that God had endowed only man with an immortal soul. The Chinese saw nature itself as divine, while the West felt that divinity was only in certain beings. The Western artist concentrated on those divine beings (including man, who had a “divine spark,” an immortal soul), while the Chinese artist concerned himself with all of nature. The Chinese were more relaxed and more receptive to nature than Westerners were. Chinese religions like Taoism and Zen Buddhism encouraged quiescence and passivity. Westerners, on the other hand, were more active and busy, hence less receptive to nature, and less inclined toward landscape painting. One can distinguish four types of Chinese landscape painting: Impressive Landscape, Appreciated Landscape, Plain Landscape and Quotation Landscape. Impressive Landscape is a product of the Northern Sung Dynasty (around 1000 AD). In paintings of this school, nature is awesome and dramatic. The artist is inspired by nature itself, rather than by earlier painters. Impressive Landscape resembles the work of 19th-century Western artists like Turner. Appreciated Landscape is a product of the Southern Sung Dynasty (around 1200 AD). In paintings of this school, nature is no longer awesome, and no longer towers over man. Man has become prominent. The artist depicts the cultured person who appreciates nature; the artist depicts not nature alone, but man’s response to nature. This is rarely found in Western painting. Western painting, particularly the school known as Italian Landscape, often depicts a landscape that includes ruins. Such ruins inspire thoughts about past civilizations, thoughts about the march of time, etc. Far different are the thoughts of a person in a Southern Sung landscape. Such a person can appreciate nature because his head isn’t full of thoughts. He’s attuned to the present moment, not pondering past epochs. “I’d rather be here now” is a phrase that’s sometimes used to epitomize Zen Buddhism. A person in a Southern Sung landscape is “here now” — in the present moment, not in the past or the future. Plain Landscape is a product of the Yuan Dynasty (around 1350 AD). Plain Landscape lacks the interesting details of Northern Sung landscape, and also lacks the sweetness of Southern Sung landscape. Plain Landscape makes no effort to please the viewer, no effort to attain popularity. Plain Landscape reflects the tranquillity of the artist’s soul, and also his disdain for popularity, and his disdain for the tricks that lead to popularity. Quotation Landscape is the final phase of Chinese landscape painting, and it was produced during China’s last dynasty, the Qing Dynasty. Artists no longer responded directly to nature; rather, they responded to earlier artists, and quoted earlier styles. But Qing Dynasty artists were not entirely uncreative. Qing painters began to bend reality more than earlier Chinese painters had done; in the 1700’s Chinese painters were bending reality as much as van Gogh and Gauguin did. But Chinese painting never took the step that Western painting took after van Gogh and Gauguin — that is, it never became entirely abstract, it always retained some connection to the external world. Some Qing painters, such as Shitao, achieved what great culture often achieves, namely, a synthesis of subjective vision and objective truth. 17. Borrowed and Transplanted Cultures Rome went to school in Greece, then produced first-rate poets, but never produced a philosopher equal to the leading Greek philosophers. Japan went to school in China, then produced first-rate poets and imaginative writers, but never produced a philosopher equal to the leading Chinese philosophers. Russia went to school in Western Europe, then produced first-rate imaginative writers, but never produced a philosopher equal to the leading Western European philosophers. One can infer from these three examples that borrowed cultures can achieve great richness and creativity, but can’t produce first-rate philosophers. Transplanted cultures — such as those of the Americas, Australia, and other colonized places — are often less healthy than borrowed cultures. Transplanted cultures often fail to achieve the richness and creativity of borrowed cultures. The weakness of transplanted culture is apparent in both art and philosophy. Culture can’t flourish in a raw, uncivilized land; when colonists arrive in such a land, they’re preoccupied with survival, with practical matters, with exploring and taming the land. They have little interest in culture, which requires stability and leisure. As the land is gradually tamed, interest in culture grows; the finest fruits of American culture have grown in New England, where the land has been settled and civilized for the longest time. Cultures don’t remain immature forever; eventually both borrowed cultures and transplanted cultures reach maturity. 18. Hitler and Ibsen Hitler once told his secretary that he didn’t want to have children, because the children of genius are often cretins. Hitler’s comment shows not only that he was convinced of his own genius, but also that he was a student of genius, of the psychology of genius. Hitler’s sense of identity, his sense of who he was, was determined in large measure by the Cult of Genius, a cult that he probably acquired from his favorite philosopher, Schopenhauer. Hitler felt that his genius made him the natural leader of Germany. [I] resolved never again to cry when my father whipped me. A few days later I had the opportunity of putting my will to the test. My mother, frightened, took refuge in the front of the door. As for me, I counted silently the blows of the stick which lashed my rear end. That is, he dissociated a part of himself from the self that was being beaten — as if he were acting in a play, and at the same time watching the play. As a teenager, Hitler was out of school and out of work, and he spent much of his time watching plays and operas. Later, when he became a politician, he would arrange his speaking schedule based on where his favorite operas were being performed. Multiple Personality Disorder is characterized by a disintegration of the ego, and by a facility for being hypnotized. One might say that Hitler didn’t merely watch plays and operas, he was hypnotized by them. He identified with the characters, he lived their lives. One play that Hitler attended was The King, by Hanns Johst. Hitler later met Johst, and told him that he had seen The King seventeen times, and that he himself would die in the same manner as the king in Johst’s play. And in fact, he did. But Hitler’s strongest identification was with the protagonist of Ibsen’s Emperor and Galilean, Julian the Apostate. Indeed, Hitler seemed to believe that he was Julian reincarnated. Hitler’s identification with Julian had a profound influence on his life and career. It influenced the most dramatic events in his personal life, such as the suspicious death of his niece, Geli Raubal. It also influenced the most momentous events of his career, such as his decision not to aim for Moscow during his invasion of Russia. It may seem odd that Hitler would regard himself as Julian reincarnated. It should be remembered, though, that Hitler was receptive to all forms of the occult. Furthermore, Hitler’s guru, Dietrich Eckart, believed that he was the reincarnation of one of Ibsen’s most famous characters, Peer Gynt. Unlike Julian, Peer Gynt is a fictional character, so the idea of being Peer Gynt reincarnated is even odder than the idea of being Julian reincarnated. Yet that’s what Eckart believed, and Hitler revered Eckart. “He shone in our eyes like the polar star,” Hitler said of Eckart. The connection between Ibsen and Hitler remained unknown for half a century, until it was discovered by an American scholar, Steven Sage. Apparently, Hitler never told anyone that he was following Ibsen’s scripts; he carried this secret to his grave. The Hitler that emerges from Sage’s book is the most remarkable example of life imitating art. After showing how Hitler followed Ibsen’s plays, Sage compares Hitler to other examples of “mimetic syndrome,” including John Wilkes Booth following Shakespeare, and the Unabomber following Joseph Conrad. In Ibsen’s Emperor and Galilean, it is said that Julian may be a reincarnation of Christ, and that another incarnation would take place in the future. Hitler seemed to feel that he was Christ reborn, as well as Julian reborn. Hitler said he began his political career at 30, just as Christ began his mission at 30. Hitler often carried a whip, and threatened to “enter Berlin like Christ in the Temple of Jerusalem and scourge out the moneylenders.”9 Like many other anti-Semites, Hitler viewed Christ not as a Jew, but as a Gentile; mixing the words “Gaul” and “Galilee,” anti-Semites argued that Christ was born into a colony of retired Gallic soldiers. 19. Wild Fruits Thoreau said that wild fruits taste better than farm-grown fruits. Likewise, cutting-edge theories are more exciting, more tasty, than textbook theories. An example of a cutting-edge theory is The Ibsen-Hitler Theory. This theory isn’t in any encyclopedia or textbook — it isn’t even in Wikipedia. Cutting-edge theories are the wild fruits of the intellectual world. 20. Kierkegaard Kierkegaard’s life is, in several respects, typical of the life of the intellectual, the literary person. Kierkegaard was born in Copenhagen, Denmark in 1813. Like Schopenhauer, Kierkegaard lived on inherited money. Kierkegaard’s father was a hosier (a maker of socks and hose), who enjoyed a monopoly granted by the Danish king. Kierkegaard revered his father, all the more so after his father died; he dedicated many of his books to his father, describing him as “late hosier of this city.” “My father’s death,” Kierkegaard wrote, “was a terribly harrowing event for me, I never told a single soul how terrible it was.”12 While Kierkegaard’s books and journals are filled with references to his father, he never mentioned his mother, a servant girl whom his father had made pregnant, and then married. Even as a youth, Kierkegaard had his father’s melancholy. “I was already an old man when I was born,” Kierkegaard wrote. “I leapt completely over childhood and youth. I lived through the pain of not being like others. And of course at that period I would have given all to be able to be that, if only for a short time.” Like most writers and artists, especially philosophers, Kierkegaard was highly introverted: “he never in his life confided in anyone or expected anyone to confide in him.”15 Introversion and melancholy often go hand-in-hand. With his tremendous will power, and his tremendous talent, Kierkegaard felt that he could do whatever he set out to do, except for one thing: to cast off his melancholy. He had the enormous confidence in himself, in his genius, that one finds in Schopenhauer: “It never at any time occurred to me,” wrote Kierkegaard, “that there lived a man who was my superior, or that in my time such a man might be born.”16 But he also had the melancholy that one finds in Schopenhauer: “I was the most miserable of all,” wrote Kierkegaard. According to Aristotle, “all geniuses are melancholy.” In the last year of his life, Kierkegaard discovered Schopenhauer, and read him with keen interest; perhaps he recognized in Schopenhauer his equal, if not his superior. With one glance at a passer-by he was able to put himself irresistibly en rapport with him, as he himself expressed it. The person who encountered his glance was either attracted or repelled, thrown into embarrassment, uncertainty, or irritation.... While he explained his theories he put them into practice with almost every person we encountered. There was not one upon whom his glance did not make an impression. Goldschmidt was crushed by Kierkegaard’s moral strength, by the power of Kierkegaard’s inwardness, by the power of his silence. Though Kierkegaard was a master of language, of metaphor, of style, his greatest strength was his silence. When Kierkegaard was about 25, he met a 14-year-old girl, Regina Olsen, and fell in love with her at first sight. He waited for three long years before broaching the subject of marriage. She told him that she was fond of one of her former teachers, Fritz Schlegel. Kierkegaard said, “You could talk about Fritz Schlegel till doomsday — that wouldn’t help you in the least, for I will have you.”21 And sure enough, Regina eventually agreed to become engaged. “May I speak with you?” I followed him to his home. She is desperate, he said; this will be the death of her, she is perfectly desperate. I said, I shall still be able to tranquillize her, but the matter is settled. He said, I am a proud man, this is hard, but I beseech you not to break with her. In truth he was proud, he touched me deeply. But I held to my own. I took supper with the family that evening. I talked with her, then I left. Although Kierkegaard had been raised as a Christian, whatever faith he had diminished as he grew older. By the time he was 23, he had fallen into nihilism, and he thought seriously of suicide. But when he was 25, his father died, and that shattering event started him on his climb back from nihilism. When he was 28, his engagement to Regina ended, and his attitude toward life became even more serious. He was no longer living apart from life, living against life. Even when his health was good, Kierkegaard sensed that he would die young. Feeling that time was short, he worked hard, and wrote much. When he turned 36, he looked back on the previous year: “I produced more powerfully than ever before, but more than ever before like a dying man.”32 Just as he produced with a feeling that time was limited, so too he spent his inheritance with a feeling that time was limited, withdrawing the last of his money just before he died. When he entered the hospital, he said that his illness was psychic, and that he had come there to die. His race was run, his destiny fulfilled. 22. Team Player It’s great to be a team player — if the team is on track. But if the team is off track, if the team is “up to no good,” then it isn’t a virtue to be a team player, it’s a vice. Of all the vices to which mortal flesh is liable, surely this is the most common: to be a team player when you shouldn’t be, to “go with the flow” when you should stand alone. 23. Group Loyalty If we are loyal to ideals — cultural and spiritual ideals — we won’t have much loyalty to nation/school/business/institution; individual ideals will take precedence over group ideals. Most writers — Joyce, Nietzsche, Ibsen, etc. — had little national feeling; indeed, they were often sharp critics of their nation, just as the Hebrew prophets were sharp critics of their nation. “Self-culture,” wrote Wilde, “is the true ideal of man” — self-culture, not group loyalty. If someone criticizes you for a shortage of loyalty to nation/school/business/institution, remind him that a model of group loyalty is a Nazi rally at Nuremberg. 24. Senatus Bestia If someone talks to you about the importance of consensus-building, remind him of the Roman adage, senatores boni viri, senatus bestia (senators are good men, the senate is a beast). Conscience is in the individual, not in the group. Instead of trying to build a consensus, instead of basing your decisions on other people’s views, base your decision on your own view of what’s right. 25. Individuals and Institutionals There are two kinds of people in the world, individuals and institutionals. An individual is a person who has a mind of his own and a conscience of his own. An institutional is a person who is at home in an institution, who knows how to play the game, who knows what direction the tide is flowing in, whose mind and conscience are not his own, but belong to the world around him. 26. Perfect Bureaucrat Institutions are sometimes founded by idealists, but they’re perpetuated by bureaucrats. The perfect bureaucrat is subservient toward superiors, ruthless toward inferiors. Kiss up, kick down. 28. Saturnine “Hiring Smiling Faces” reads a sign at McDonald’s, and doubtless many companies follow the same policy. What chance does a poor philosopher, who rarely smiles, have of landing a job? Don’t melancholics deserve an equal opportunity? Should we be discriminated against just because we were born under Saturn? Should doors be closed to us because we’re saturnine, not jovial? The leader hides his feelings, and ignores the feelings of others. He is ruthless in pursuing his institution’s interests, or his own interests. He makes rules, but he doesn’t follow rules; to him belongs the privilege of violating both legal and moral rules. Is it surprising, then, that many of today’s business leaders are in prison or under indictment? As the Good Book says, “Pride goeth before destruction, and an haughty spirit before a fall.” The Leadership Disease is widespread in American society, and affects countless institutions. 30. Homo Homini Lupus The abuse of Iraqi prisoners by American guards is further evidence (if any were needed) that evil is embedded in human nature. Long ago, the Romans said homo homini lupus (man is a wolf to man), but somehow we think that this doesn’t apply to us, and we’re surprised to find that it still applies, that the goblins have returned, and always will return. Another Roman saying is also applicable to this incident: senatores boni viri, senatus bestia. People who are individually decent can become depraved when they’re in a group; moral restraints that are effective when a person is alone become ineffective when the same person is in a group. 32. Digital Malice Philosophers and psychologists are agreed: man has a dark side, an evil side, a sadistic side, a shadow. We know this from history, from literature, from observing others, from observing ourselves. We find this dark side in primitive peoples and civilized peoples alike. 33. Moral Order There seems to be a moral order in the universe. Evil — such as we find in Hitler, Stalin, Macbeth, etc. — eventually comes to grief. On the other hand, evil often brings many innocents down with it; one might say that the moral order punishes evil, but doesn’t always reward virtue. Furthermore, if we look for the source of evil, we find that the universe itself produces Hitlers, Stalins, and Macbeths; in other words, the universe produces the very evil that it later destroys. Evil is almost as much a part of the fabric of the universe as good. 35. The Young Intellectual One of the biggest problems of an aspiring writer, a young intellectual, is that he doesn’t get along well with people. One reason for this is that he doesn’t respect anyone. “Is respect a feeling that’s foreign to him?” No, quite the contrary. But he lavishes all his respect on those whom Keats called “the mighty dead,” and he has none left for his contemporaries. This lack of respect for people is matched by a lack of respect for institutions: he respects neither academia nor the business world. Academia is, in his view, a pale imitation of the literary world to which his reading has introduced him, and business is a lot of sound and fury signifying nothing — or rather, signifying nothing except money. The young intellectual’s feelings, as well as his thoughts, cause him to clash with society. His feelings are often crude, primitive, unconscious. He is enlightened, and spreads enlightenment, but “the brighter the light, the darker the shadow.” For every Faust, a Mephistopheles. If one adds up all these factors — bad relations with people, lack of respect for people, an aversion for the academic world and the business world — it seems most unlikely that the young intellectual will have much success in the world. 37. Corners On several occasions, he tried to fit into an institution, but he never succeeded, it was like fitting a square peg into a round hole — he had too many corners. 38. Chiaroscuro His wife could light up a room, and he could darken a room, so if the two of them were together, chiaroscuro effects were achieved that reminded some people of Rembrandt, and others of Caravaggio.